There are times when the world seems to have gone mad. I have heard some ludicrous news stories in recent months, but there is nothing like the continuing saga of Brexit to keep observers amazed at the propensity of people who really should know better to single-mindedly try their best to maintain a straight line course to self-destruction for us all. In fact so disturbing do I find this that, undemonstrative man that I usually am, I spent part of an evening recently pontificating on the subject. It was a most convivial get together, one of the attendees being the only man I keep in touch with from my student days. Neither of us are very good at maintaining contact with old friends, but I don’t ever remember us disagreeing about anything, well nothing important anyway, and in the days before the internet allowed me to reach out to other troubled souls he was the only other cricket tragic I knew. Ironically enough my old friend was wearing a ‘Proud to be a Remoaner’ tee shirt, so it probably came as a surprise to those sat with us when he suddenly looked me in the eye and announced that I was a hypocrite. The breadth of his grin and the depth of our friendship was such that I knew immediately what he was referring to. One of the many things we have in common is our admiration for David Gower. The year of Gower’s international debut was our A Level year. I missed the century he scored in his second ODI, an Economics exam sadly taking up my time. I was sat in front of the television a few days later however when he made his first Test appearance. Naturally I was spending a good deal of time revising, but kept an eye on the television and made sure I was taking a break from my cramming when, with England comfortably placed at 101-2 in response to 164, Gower walked out to face his first delivery. The bowler was Liaquat Ali. Because my memory of the delivery is so vivid Liaquat’s name is also imprinted on my mind, although looking him up tells me this was the penultimate appearance of a five Test career in which he took just six wickets at almost 60 with his left arm fast medium. That is certainly an ordinary record, although my memory is of a decent bowler. In any event he came in to bowl to the debutant and made the mistake of trying a short one. Gower pulled the ball to the boundary in the nonchalant way he was to do so frequently over the next decade and a half. It was an absolute classic, elegant yet also indolent, and made to look so very, very easy. Over the years Gower was to try my patience on many occasions, but whatever he did I never found myself able to lose faith in him. After just one delivery of his Test career Gower had earned a permanent ‘Get Out Of Jail Free’ card as far as I was concerned. In years to come he would certainly irritate a few, most notably future Chairman of Selectors Peter May, but for me, my University mate and many others he was always forgiven. Heck I’d probably even give his opinions house room if he advocated a Hard Brexit rather than a change of bowling at the Pavilion End. In fairness to Gower it was some time before he needed to consider playing his card. It was his tenth Test before he made a single digit score in Tests, and 1980 before he first split opinion. His first winter overseas was in Australia in 1978/79, but World Series Cricket had claimed the top Australian players and Mike Brearley’s side were not unduly troubled. A year later and the dispute settled England hurried back out to Australia again to play a three Test series against the full strength of their hosts. The 4-1 victory of 1978/79 turned into a 3-0 reverse and Gower was out cheaply in five of his six innings. Had it not been for a fine unbeaten 98 in the second innings at Sydney he would have had nothing at all to show for the series. As it was, just to prove there are times when you can’t please anyone, he picked up some criticism for leaving last man Bob Willis exposed to Dennis Lillee, thereby costing himself a century. From there Gower contributed little to the Jubilee Test in India, but in light of Ian Botham’s one man show Gower fans were not too worried about that. Back in England in 1980 the West Indies were in town. Ian Botham was England’s new skipper and it was the first time the two sides had met since Tony Greig’s ill-advised statement in 1976 that he intended to make the men from the Caribbean grovel. There was to be a return series the following winter as well, so the novice skipper had his work cut out. Brian Brain turned 40 in 1980. He was a journeyman medium fast bowler then with Gloucestershire and previously with Worcestershire. He became a better bowler as he aged, but I certainly don’t recall him ever being talked of as an England player. In any event he published a diary of his 1980 summer. Pre-season he wrote of the England side in the winter just gone; they’re getting paid extremely well for not playing professionally. David Gower, in particular, makes my blood boil. I can name thirty other English players who wouldn’t have sold their wickets as cheaply as Gower did in the winter. The selectors clearly didn’t agree with Brain, although it seems likely they had some sympathy with his views. Gower was retained for the two ODIs and the first Test. He contributed just 12 to each of the ODIs and 20 and 1 to the Test. Perhaps as significantly with West Indies needing 13 to win with three wickets to fall Andy Roberts hit the ball skywards. It was one of those horrible swirling catches that all cricketers dread. Gower was a wonderful fielder, magnificent in the covers until shoulder damage robbed him of the powerful flat throw that so often took batsmen by surprise. But he dropped this one, and West Indies went on to win, and after that it was Gower who was dropped. By the end of the summer Gower had scored a couple of centuries for Leicestershire, his first for the county since 1977, so he had clearly taken on board at least some of what was said to him. His recall for the centenary Test at the end of the summer produced further evidence of a growing maturity. Unlike the Australian version three years previously this was a disappointing game, but Gower scored 45 and 35. In the second innings, with England briefly in danger of defeat, he dug in with Geoffrey Boycott for ninety five minutes, and was actually outscored by the Yorkshireman. Sufficient credit with the selectors having been gathered Gower took his place on the winter’s tour of the Caribbean. He was as upset as everyone else in the England party when Kenny Barrington died during the third Test. For Gower’s batting it was a case of consolidation initially. He didn’t fail once, but at the same time didn’t get past 54 in the first four Tests, only three of which actually started – the Georgetown Test was called off as the Guyanese government would not allow Robin Jackman into the country. In the last Test however, with England at one point in grave danger of defeat, what The Cricketer described as ‘the new Gower’ batted for almost eight hours for an unbeaten 154 to see them safely to a draw. Wisden put it rather well; if he was still out to the loose or casual stroke, he now seldom succumbed to the wildly irrational one. 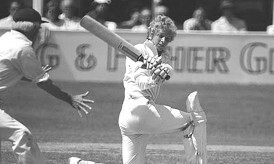 In 1981 Gower never threatened to take the limelight from Botham, but made a solid contribution to England’s famous victory. After that he set out on 13 consecutive Tests against sub-continental sides and in many ways was at his most frustrating. There were as many as seven occasions when he got past fifty, and three more times when he passed forty, but no century. Would the elevation to Bob Willis’ vice-captain for the 1982/83 Ashes help? It probably did as he at last made another century and then two more at home against New Zealand. The big transformation seemed to come the following winter, although as ever there was precious little television coverage and it seemed improbable for some time. First of all England lost a series in New Zealand, and Gower found no form at all. It was no better in Pakistan, as England lost the first Test and then their captain. Gower’s first Test in charge was in Faisalabad. He made 152 to make sure his team couldn’t lose and then in the next Test an unbeaten 173 in another draw. His captaincy, as relaxed as his batting, attracted praise as well and suddenly it looked like the secret to managing him had been found. Was Gower a good captain? The answer seems to be both yes and no. He was of course a fine player, and understood the game well. He also thought about the game and, importantly, wanted to be captain. But as to his ability to do the job there are almost as many opinions out there as runs that he scored. One thing that he certainly lacked was a team of quality players under him, and it is self-evident that a high class team will, to a certain extent, lead itself. As Gower said to the baying press pack as his side went 4-0 down against the 1984 West Indies; What do you want me to do? What can I do? We’re trying but they are just better than us. It must have been the case that Gower could forge a good team spirit as the eventual 5-0 drubbing by Clive Lloyd’s men notwithstanding the side he took to India in 1984/85, despite missing Graham Gooch, John Emburey and Peter Willey (all banned as a result of their part in a rebel tour to South Africa in 1980) and Ian Botham (resting) won 2-1 despite losing the first Test. The following summer an Australian side under the first version of Allan Border was beaten 3-1. Such were Gower’s spirits after the final Test at the Oval that he speculated with the press that England’s next opponents, the West Indies in their own backyard, would be quaking in their boots. It wasn’t quite the same as declaring an intention to make the men from the Caribbean grovel, but the effect was much the same. The following winter saw a second successive 5-0 defeat. Botham was there, but not in any sort of form, as was Gooch, but he seemed distracted by the issues his South African connections were creating. As for Gower he had recently lost his mother and had troubles at home so it was a credit to his professionalism that he managed to top the England batting averages with 370 runs at 37.00. Unsurprisingly given that he faced more of the bowling than anyone else he counted himself as one of those who was shell shocked long before the end. There were, inevitably, some calling for Gower’s removal on his return. The then Chairman of Selectors, Peter May, did of course speak to Gower, but their conversation did nothing to assist. May chose to give Gower a dressing down and the recipient was less than impressed, feeling May had done no more than regurgitated the views of the tabloid press rather than actually say anything constructive. Predictably Gower did not pander to May and once the 1986 ODI series against India and the first Test at Lord’s had been lost he was sacked. May received some merited criticism for the way that was done. Gower was, as captain, giving a post match interview after the Test to the BBC at the very moment May was in the dressing room giving his job to Mike Gatting. Back in the ranks Gower could not prevent defeats by 2-0 to India and 1-0 to New Zealand, but as the summer wore on he warmed up and his contributions culminated in a fine century in the final Test of the New Zealand series. He also made a steady contribution to the unexpected victory against Australia in 1986/87. No doubt Gower thought he was well out of the captaincy when things turned sour again in 1987, a home series being lost to Pakistan for the first time. After that the ‘Shakoor Rana Incident’ in Pakistan followed swiftly by the ‘Bar Maid Incident’ during the first Test of the next instalment of England’s travails against West Indies put an end to Gatting’s captaincy. After that John Emburey, Chris Cowdrey and finally Gooch all took a sip from the poisoned chalice. In the winter of 1988/89 Gooch was due to take England to India, but his South African connections were unacceptable to the hosts so the tour did not proceed. May decided to retire in the December and a full time supremo was appointed. Ted Dexter was the man given the unenviable task of leading England out of the doldrums. ‘Lord Ted’ wasn’t impressed by Gooch, who he famously described as having all the charisma of a wet fish. At the crease there were certainly similarities between Gower and Dexter, both crowd pleasing batsmen who, on their day, could make batting look the easiest occupation in the world. In addition if not exactly similar their personalities were certainly more in tune with each other than those of Dexter and Gooch. In the circumstances it was not such a surprise as it might have been when Gower was offered the England captaincy for the 1989 home Ashes series. What was perhaps a little more unexpected was the extent to which, given his previous experience, Gower grabbed the opportunity with both hands. So delighted was he that in the first County Championship match of the summer he hammered the Glamorgan attack to the tune of 228. It was to remain the highest score of his career. Border version one had been in the traditional mould of Australian captains. He was a tough competitor on the field but a congenial enough character after the close. Version two was very different, aggressive and uncompromising at all times. According to Gower his former friendly rival uttered just four words to him all summer, heads, tails, we’ll and bat. And bat is exactly what Mark Taylor and Steve Waugh did, remorselessly for hour after hour, and the records of the other Australian batsmen were none too shabby either. It was the same with ball. Geoff Lawson and Terry Alderman were outstanding, and the rest merely decent. Having been hit by an opposition much superior to expectations Gower’s mood was not improved when he learned that he had not actually been the selectors’ first choice for the captaincy. In fact the selectors wanted Gatting, but a veto by the old Test and County Cricket Board had put the kybosh on that one, previous transgressions not having yet been forgiven. It didn’t help that that news was broken to Gower by Emburey of all people, as the fourth Test at Old Trafford slipped away, nor that it came out in the context of an announcement that Gatting had agreed to take another rebel side to South Africa. Along the way of the disastrous summer of 1989 there had been another less than successful relationship as Gower had struggled to work with the new England coach, Mickey Stewart. The former Surrey and England opener had qualities of his own, but overall was rather more in synch with the discipline and work ethic of a Gooch. It seems both Stewart and Gower tried hard to work together successfully, but the team’s results showed the relationship was not working. It was no surprise to anyone when Gower was sacked nor, given prevailing attitudes in the corridors of power, that Gooch was given the job of working with Stewart for the 1989/90 trip to the West Indies. What was rather less predictable was Gower’s omission from the touring party. He was 32, so not yet a veteran, had as good a record as anyone in the Caribbean and despite the disastrous results of 1989 only Robin Smith of England’s batsmen had scored more runs. Less controversially England’s former talisman, Botham, was also left out, although there were still many of us who clung to the belief, never realised, that there was still a last hoorah to come from him. Given that the West Indies series, had it not been for some cynical time wasting by the hosts, would have been drawn it is difficult to criticize the selectors. Gower had plenty of cause reason to feel aggrieved at not being chosen, but he seems not to have been too unhappy. He took the chance of a winter off to have surgery on his troublesome shoulder, and to join Hampshire for the 1990 summer. By the time England actually got to the Caribbean in February Gower was in fact with them, sat in the press box. With his personal and cricketing lives looking up, and his shoulder on the mend there was certainly no ill-feeling and a demonstration of goodwill was shown on both sides at the end of the tour when Gower joined his former teammates as cover in an injury crisis. He might have played in the final Test, but a failure in his single First Class outing convinced all that he was not quite ready for that. The first part of the 1990 summer saw Richard Hadlee dismiss Gower cheaply twice in ODIs, a format which had not excited him for some years, and he failed to make the Test side. He was back against India however, a series remembered for Gooch’s monumental 333. In the first two Tests Gower made four decent starts without going beyond 40 as England took a 1-0 lead. In the third Test England followed on 266 behind but in a disciplined unbeaten 157 over four and half hours Gower made sure there was no danger of defeat, and at the same time booked his place on the 1990/91 Ashes trip. There were some England supporters who took the view that the 1989 Ashes were an aberration, and that normal service would quickly be resumed. We soon learnt the error of our ways. Australia won the first Test by ten wickets, though Gower, with 61 and 27, top scored in both England’s sorry innings. The margin in the second Test was eight wickets. With exactly 100 in the first innings Gower top scored again, so his legion of admirers forgave him his dismissal for a duck in the second knock. In the third Test England avoided defeat, and did so comfortably. In their first innings Gower was the star again, scoring 128. In the second innings, going in first with Gooch because of an injury to Mike Atherton, he contributed 36 to a stand of 84. Despite that the relationship with Gooch the martinet was already unraveling and came to a head shortly afterwards with the disciplining of Gower and John Morris for their infamous trip in a Gypsy Moth biplane. Both men received the maximum fines permissible under their contracts and were told they were fortunate not to have been sent home. Whether that reaction was over the top is a matter of opinion, although it certainly seems it to this writer, but the effect on Gower was that his form immediately deserted him. In his own words; it was frightening to go from such sublimely good touch to more or less forgetting how to bat. There was no place for Gower in the 1991 Tests against West Indies, although he was back in 1992 against Pakistan. He looked dead set for a century in his comeback Test, before one of those frustrating wafts outside off stump cost him his wicket. The last Test of the series at the Oval was the last of Gower’s career, although no one saw that coming. He was dismissed by Waqar Younis in his last Test innings. He played and missed a few times and was then bowled by a great bowler in his finest series. It was not the right way for a great champion to bow out. Gooch had assured Gower he would be selected for the 1992/93 tour of India that winter. In the event however he wasn’t, and learnt of his omission from the press prior to Gooch telephoning him. Gower was furious and understandably so. He still went to India, but in a very different role, sat behind a microphone in the Sky TV commentary box. 1993 brought another one-sided Ashes contest and Gooch’s resignation. Gower had thought that he may still have something to offer the selectors and, largely thanks to three centuries in his final six matches, he had a decent season for Hampshire averaging 42. Sadly howeverthe late burst was not enough to convince new England captain Michael Atherton that he needed Gower’s old head in the West Indies in early 1994 and, not without some indecisiveness along the way Gower decided to call it a day, and at 35 the most stylish batsmen of his generation gave up playing the game in favour of talking about it. Since then Gower has spent many an hour in my living room as a Sky commentator and, latterly, its face of Test cricket. He might not be quite as highly rated with the microphone as some, but his views are always worth listening to, and the memories of the way he batted are never very far away.